So we explored some options and landed on a creative option — live streaming our demos through a video website that is accessible by most government agencies, doesn’t require extraneous plugins to operate, allows you to easily stream, but also automatically creates a viewable file afterwards at the same URL. YouTube is widely accessible behind government firewalls, and has useful functionality for both presenters (Hangouts On Air, an enhanced version of the video chat program) and viewers. After mistakenly launching and ending the first live attempt before it was supposed to go live, we learned how to use the tool, and it really helped us share information across many agencies, teams, and individuals. We’re also excited about this serving as an archive of our work. We figured out a way to do use the live stream option, but also allow for some interactivity. While streaming, there is about a 30-second delay between when the presenters are presenting and when it shows up on the live stream, so to manage that, we split the demos into two parts — a presentation and then a forum/feedback session — in which we use a phone conference line on a speakerphone to record the discussion into the video for questions and answers back and forth without the 30-second latency. If we need to, we can still use the visuals of Youtube (with the 30-second delay). 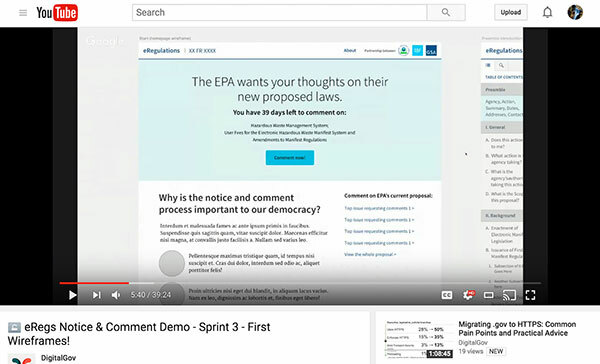 eRegs Notice & Comment Demo – Sprint 3 – First Wireframes! eRegs Notice & Comment Demo – Sprint 4 – More Wireframes! eRegs Notice & Comment Demo – Sprint 5 – Wireframes & Working Code!